Google Play is full of task managers for Android. These utilities can show you apps running in the background, kill running apps, and otherwise manage your apps — but you don’t need to install any third-party software to do this. We’ll show you how to quickly and easily kill and manage your running apps using only the software included with your Android phone. Third-party task managers are unnecessary and many include harmful features, like task killers. Task managers and task killers are often one and the same. 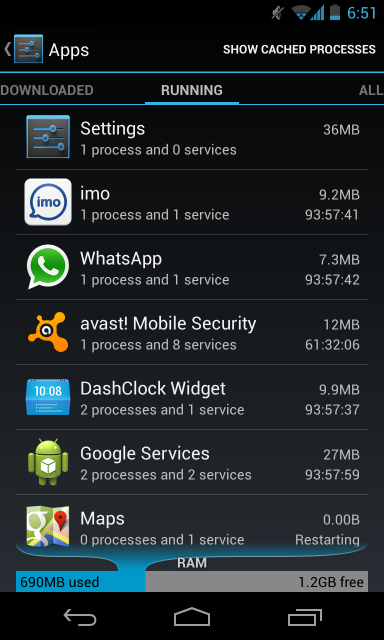 A task killer promises to speed up your phone by automatically killing apps running in the background. It stays running in the background, automatically removing apps from memory when you’re done using them. However, we’ve already explained why you shouldn’t use a task killer on Android. In a nutshell, Android doesn’t manage processes like Windows does. Properly behaved apps running in the background aren’t actually doing anything — they’re just remaining in memory and using no CPU or other resources. When you access them again, they’ll quickly open, as they’re waiting in memory for you to return. If they were removed from memory, they would take longer to re-open as their data would have to be transferred from system storage back into RAM — in this way, a task killer can actually slow things down. Android includes its own automatic task killer — if its memory fills up and it needs more memory for other reasons, it will automatically kill running apps, removing them from memory. You don’t have to install any software to take advantage of this. If you would like to manually close an app and remove it from memory, this is extremely easy on the latest versions of Android — Android 4.0 and up. First, open the multitasking screen. On a Nexus 4 or Galaxy Nexus, simply press the dedicated multitasking button. On a phone without a multitasking button, like a Galaxy S4 or HTC One, you may have to long-press or double tap the home button to open this screen. Next, swipe a recent app to the left or right of the screen and its thumbnail will disappear. In addition to removing this app from the list of recent apps, cleaning up the list, Android will also remove the app from memory. Killing an app is generally not necessary. However, it can help if the app is misbehaving — killing and re-opening the app may cause it to work properly. 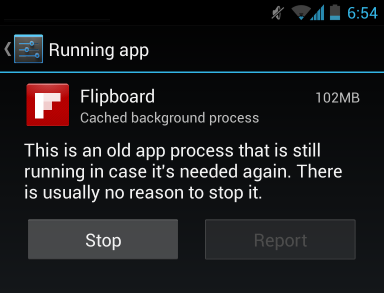 You can also end running apps from Android’s settings screen. First, open the Settings screen and tap the Apps category. 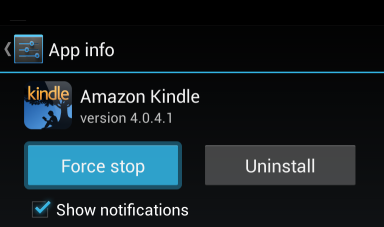 Scroll down in the list, select an app, and tap the Force stop button to end the app’s running process and remove it from memory. 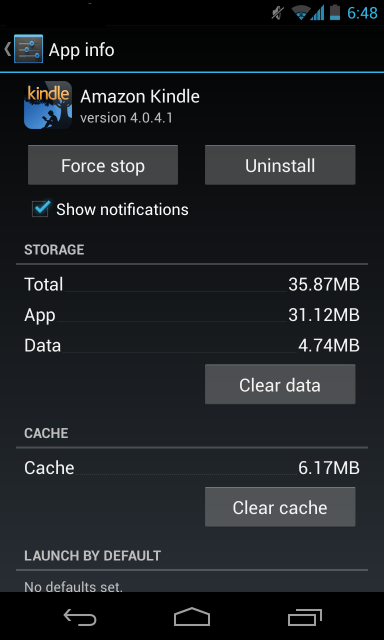 From the app’s info screen where the Force Stop button is, you can also prevent the apps from showing notifications, view the amount of storage the app is using, clear its data or cache, prevent it from being a default application if it’s set as a default app, and view its permissions. From the Apps settings pane, you can also swipe over to the Running category to view apps that are running in the background. 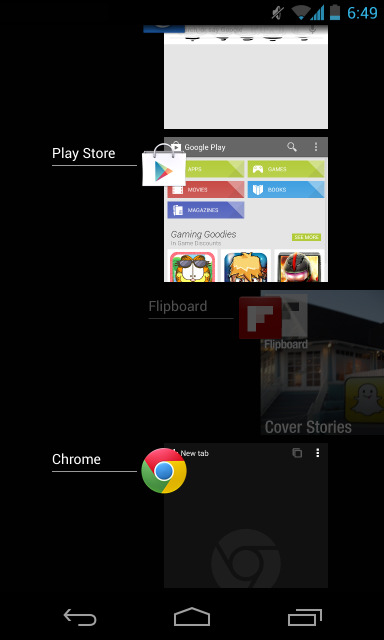 These apps aren’t just remaining in memory. They may start automatically at boot and stay running in the background so they can automatically do things. For example, chat apps like WhatsApp may remain running in the background so they can automatically receive messages. If you would like to prevent these apps from running in the background, your best bet is to uninstall them from your phone — you can end their tasks, but they’ll just restart anyway. Note that these apps may use very few resources, so you shouldn’t necessarily worry if they’re running in the background. If they’re running in the background and you don’t see them consuming much memory, battery, or network resources, they’re safe to leave alone. Tap the Show Cached Processes option at the top-right corner of the screen to view apps that are cached in memory, but aren’t actually running in the background. You can end such apps’ processes from here by tapping them and tapping Stop, but there should be no reason to do so. At the bottom of the Running apps screen, you’ll see a RAM meter. This shows you how much of your phone’s memory is being used and how much is free. Note that this can be misleading — your RAM may appear to be rather full, but it may just be full of cached applications. This will speed things up later — it’s good that your RAM is full, as Android is using your RAM as a cache to speed things up. 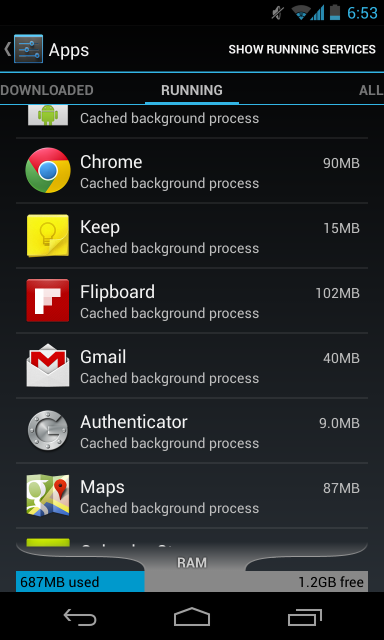 The Running apps screen also displays the memory used by running services and cached processes, so you can identify which apps are the most RAM-hungry. 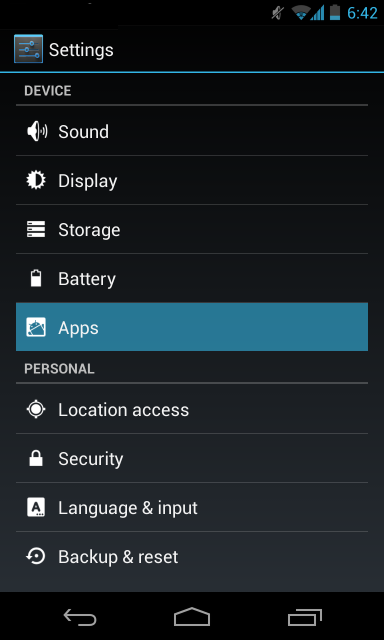 To view app-specific battery use, open the Settings screen and tap the Battery option. 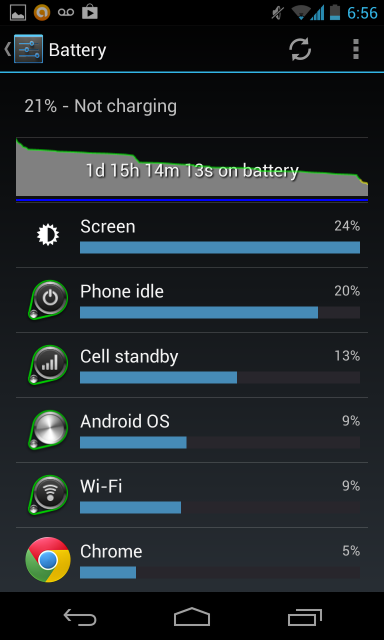 You’ll see a list of phone functions and apps, sorted by how much they’ve used your battery. This screen can help you see how apps are using your CPU and other resources. You’ll probably see apps you frequently use near the top of this list. If you see an app you don’t use here, it’s likely consuming resources in the background — you’ll want to uninstall it if you don’t use it. The various task management features in Android should be more than enough for most people. The biggest feature available in third-party task manager apps is the task killer, but you shouldn’t need to automatically kill applications. Android will do that for you when it’s actually necessary.